Read through our Optometrists biographies to learn about there experience & expertise. Andrew graduated from the University of NSW with honours in 1975. He completed his Master of Optometry degree in 1976. Further post-graduate studies were completed in the use of drugs for diagnostic and therapeutic purposes. 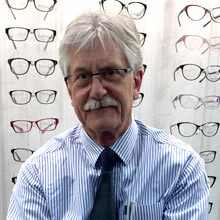 In 1977 Andrew joined and later became a director of the Adelaide optometric firm J. Holland Pty Ltd until 1989. In 1990 Andrew established his own practice in Aldgate and in Norwood with Peter Delaney. Andrew is a past president of the South Australian Optometry Association and deputy chairman of the nationally based consortium, “Australian Independent Optometrists” (now known as “Provision”). Stuart studied at University in Glasgow, Scotland. He graduated in 1994 with a diploma in ophthalmic dispensing and again in 1998 with an honours degree in Optometry. In 1999 following a year in private practice in Edinburgh, Scotland he passed the professional exams from the British College of Optometry in the UK. For the next two years he worked as an optometrist at the biggest contact lens practice in the UK located in Newcastle-Upon-Tyne. After four years of work in private practice in the North East of England, Stuart decided to emigrate to Adelaide and continue work in an independent practice. He became a director of Thomas & Mackay in 2009. Stuart has an interest in all aspects of optometry, but particularly contact lenses. Call in to your local practice and make an appointment with one of our friendly and professional optometrists today.